Neovascular glaucoma (NVG) is a severe form of secondary glaucoma characterized by proliferation of fibrovascular tissue in the anterior chamber angle. Since Coats first noted new vessel formation on the iris (rubeosis iridis) in eyes with central retinal vein occlusion in 1906, this condition has been noted previously by names including hemorrhagic glaucoma, congestive glaucoma, thrombotic glaucoma, and rubeotic glaucoma. Weiss and colleagues introduced the term neovascular glaucoma in 1963. The common denominator predisposing to this condition is usually retinal ischemia, although some cases are associated with other ocular or extraocular entities. Neovascular glaucoma runs an aggressive clinical course and the condition is usually refractory to medical therapy alone. Surgical approaches to managing this complicated form of glaucoma have evolved over the past few decades while often still resulting in a guarded visual prognosis. In light of the association of vascular endothelial growth factor (VEGF) with retinal ischemia, the advent of anti-VEGF drugs may provide a welcome addition in the treatment strategy for this potentially devastating condition. NVG can present through either a secondary open-angle or secondary closed-angle mechanism depending on the extent of neovascularization. Neovascularization within any organ system can be characterized as the growth of vessels into or onto tissues not normally vascularized. Blood vessels generated through neovascularization have different qualities than normal ones. The walls of these vessels have increased permeability due to the absence of tight intercellular junctions, which are prone to vascular leakage and variable amounts of cellular inflammation. When new blood vessels appear within the anterior chamber angle, aqueous outflow can be compromised with extension of these new vessels across the scleral spur and subsequent obstruction of the trabecular meshwork. The new blood vessels are usually accompanied by a fibrous membrane, and contraction of this membrane results in formation of peripheral anterior synechiae and progressive angle closure. Rubeosis iridis and NVG has been associated with a wide range of conditions (see Risk Factors). Of these conditions, retinal ischemia accounts for the majority of the causes, with CRVO and diabetes retinopathy producing nearly two thirds of all cases of NVG. Retinal ischemia triggers a cascade of events beginning with an inadequate oxygen supply to the retina cells leading to the release of various angiogenic factors including VEGF and interleukin-6. Normally VEGF levels are in equilibrium with pigment epithelium-derived growth factor (PEDF), an antiangiogenic factor. When the equilibrium between VEGF and PEDF is shifted in favor of VEGF, this promotes activation, proliferation, and migration of endothelial cells, leading to neovascularization of the anterior segment. Increased levels of Interleukin-6 have also been noted in the aqueous humor of patients with neovascular glaucoma due to central retinal vein occlusion. Normal blood vessels in the iris have nonfenestrated endothelial cells with tight intercellular junctions. New vessels are thin-walled lacking a muscular layer or much adventitia or supporting tissue. Neovascular vessels demonstrate gaps in the endothelial cells on electron microscopy, fenestrations in the endothelial cells, and basement membrane changes in new vessels in diabetic eyes.The new vessels are often accompanied by a fibrovascular membrane consisting of proliferating myofibroblasts, which are fibroblasts with smooth muscle differentiation. Scanning electron microscopy has confirmed the presence of this membrane, and the contractile smooth muscle components can lead to anatomical changes including effacement of the iris surface, ectropion uveae, peripheral anterior synechiae formation, and angle closure. The American Academy of Ophthalmology's Pathology Atlas  contains a virtual microscopy image of Neovascular Glaucoma. The progression of rubeosis iridis to advanced NVG can be broken down into four stages: prerubeosis, rubeosis, open angle glaucoma, and angle-closure glaucoma. In the prerubeosis stage, new vessels on the iris or the angle are not detectable. The three most common clinical entities leading to rubeosis iridis are diabetes mellitus, central retinal vein occlusion, and carotid occlusive disease. Patients with these conditions or any other predisposing factors should undergo careful slit lamp examination to detect for early signs of neovascularization. Fundus fluoroscein angiography or quantitative laser photometry with iris fluoroscein angiography may aid in detecting occult neovascularization. In the rubeosis stage, tiny tufts of new vessels begin to appear on the iris usually beinning at the papillary margin. 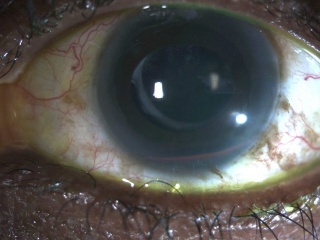 The angle is spared and the intraocular pressure is normal at this stage. 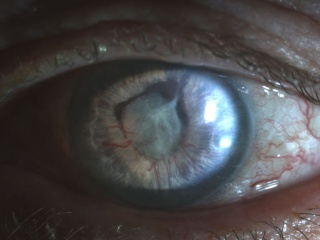 In the third or open-angle glaucoma stage, new vessels begin to coalesce and invade the iris stroma and the angle. The angle will appear to be open on gonioscopic exam while the intraocular pressure may be normal or elevated. In the final stage or angle-closure glaucoma stage, the new vessels become more widespread with an overlying fibrovascular membrane resulting in flattening of the iris and anterior displacement of the iris, resulting in eventual total synechial closure of the angle. Awareness of risk factors and early detection of retinal ischemia can minimize subsequent anterior segment neovascularization or expedite treatment leading to vessel remission. Diagnosis of NVG is primarily clinical. In patients with diabetes, onset of NVG is usually correlated with glucose control. The Diabetes Control Complications Trial (DCCT) noted a 24% incidence of NVG over 9 years amongst the standard treatment group compared to 8% in the intensively treated group. Presence of proliferative diabetic retinopathy and anterior segment neovascularization would strongly suggest diabetic NVG. Painless sudden decrease in vision 60-90 days prior would be typical of CRVO-related NVG. History of significant carotid artery occlusion on the same side with elevated intraocular pressure would raise one’s suspicion of ocular ischemic syndrome as the etiology of NVG. The earliest signs of NVG are tiny tufts of new vessels at the margin of the pupil and engorgement of major arterial circle of the iris. Whereas normal vessels tend to lie in the stroma and are radial in orientaion, neovascular vessels appear on the surface of the iris and take on an irregular, meandering pattern. As the vessels migrate towards the angle, one may observe on gonioscopy very fine arborized vessels, which cross over the scleral spur onto the trabecular meshwork, whereas normal vessels typically remain behind the scleral spur. With advancing disease, a fibrovascular membrane, invisible on gonioscopy, has a tendency to contract and pull the vessels taut. Tenting of iris onto trabecular meshwork, with a cascade of coalescing peripheral anterior synechiae leading to synechial angle closure. Differential diagnosis can be broken down into etiologies of true NVG and other ocular conditions that can clinically mimic the presentation of NVG. 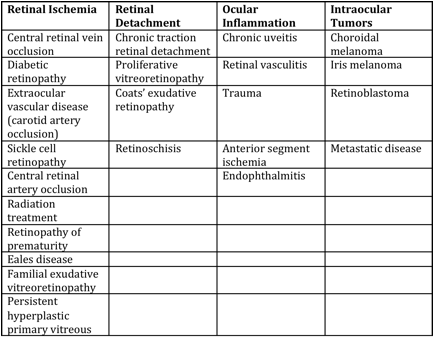 These are summarized respectively in the tables below (taken from Glaucoma: Science and Practice by John Morrison and Irvin Pollack). Adequate treatment of retinal ischemia with PRP is essential in reducing the stimulus for neovascularization of the anterior segment, which may prevent the need for additional surgery. Treatment of underlying systemic disease may improve neovascularization of the iris, as is the case with endarterectomy for carotid occlusive disease and ocular ischemia. The advent of anti-VEGF agents has lead to their use in the form of intravitreal injections prior to PRP. 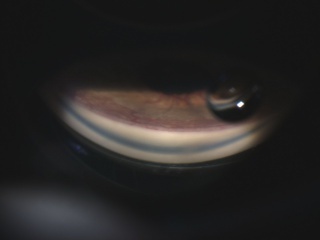 The duration of suppression of iris and angle neovascularization lasts approximately 3-6 wks with anti-VEGF injections, thereby creating a window of opportunity to allow adequate PRP to be carried out. Selection of specific agents to lower IOP depends upon the stage of NVG when discovered. Given the fact that elevated IOP is in part due to compromised trabecular meshwork function, aqueous suppressants (beta blockers, alpha-agonists, carbonic anhydrase inhibitors) are likely to have higher efficacy. Prostaglandins may be effective but may also exacerbate ocular inflammation. Miotic agents or any other medications acting on aqueous outflow are usually ineffective if the angle is already closed. Osmotic agents may be used to clear the cornea for treatment or diagnosis. Adjunctive treatment with topical steroids may control inflammation to improve outcome of subsequent surgery whereas cycloplegics may aid in patient comfort and improve visibility for PRP. The presence of florid neovascularization poses a significant risk for intraoperative and postoperative hemorrhage, either extra- or intraocular. While trabeculectomy offers the advantage of achieving lower postoperative IOP compared to aqueous shunts, failure to adequately resolve active neovascularization may ultimately lead to bleb failure through conjunctival scarring at the filtration site. Aqueous shunts bear the advantage of avoiding the necessity of surgical iridectomy, thereby decreasing the risk of intraoperative hemorrhage. In addition, aqueous shunts are more likely to tolerate intraoperative and postoperative bleeding and massive fibrin reaction in carrying out their function. Therefore, in the setting of active hyphema and inflammation, an aqueous shunt may be preferred whereas in a quiet eye with a view for adequate PRP and possible anti-VEGF treatment and/or an extensive optic nerve damage requiring a lower IOP goal, trabeculectomy may be considered. Preventing neovascularization is the most successful treatment for NVG. High index of suspicion based on the patient’s history and early recognition of high risk eyes is crucial to a favorable long-term outcome. American Academy of Ophthalmology. Glaucoma: Neovascular glaucoma Practicing Ophthalmologists Learning System, 2017 - 2019 San Francisco: American Academy of Ophthalmology, 2017. ↑ Wand M., Neovascular glaucoma. In: Ritch R, Shields MB, Krupin T, eds. The Glaucomas – Clinical Science. 2nd. Ed. St. Louis: Mosby; 1996: 1073-1129. Ch 51. ↑ Coats G., Further cases of thrombosis of the central vein. Roy Lond Ophthal Hosp Rep 1906; 16:516. ↑ Weiss DI, Shaffer RN, Nehrenberg TR Neovascular glaucoma complicating carotid-cavernous fistula. Arch Ophthalmol. 1963; 69:304-307. ↑ Sivak-Callcott JA, O’Day DM, Gass JD, et al. Evidence-based recommendations for the diagnosis and treatment of neovascular glaucoma. Ophthalmology. 2001; 108:1767-1776. ↑ Hayreh SS., Neovascular glaucoma. Prog Retin Eye Res. 2007; 26(5): 470-485. ↑ Tamura T. Electron microscopic study of the small blood vessels in rubeosis iridis diabetica. Jpn J Ophthalmol 1969;13:65. ↑ Chen K-H, Wu C-C, Roy S, et al. Increased interleukin-6 in aqueous humor of neovascular glaucoma. Invest Ophthalmol Vis Sci 1999;40:2627. ↑ Tamura T., Electron microscopic study on the small blood vessels in rubeosis iridis diabetica, Jpn J Ophthalmol 13:65, 1969. ↑ Vannas A., Fluorescein angiography of the vessels of the iris in pseudoe-exfoliation of the lens capsule, capsular glaucoma, and some other forms of glaucoma, Acta Ophthalmol Suppl 105:9, 1969. ↑ 10.0 10.1 John T, Sassani, JW, Eagle RC, The myofibroblastic component of rubeosis iridis, Ophthalmology 90:721, 1983. ↑ Diabetes control and complications trial research group. Progression of retinopathy with intensive versus conventional treatment in the Diabetes Control and Complications Trial. Ophthalmology. 1995; 102:647-661. ↑ 13.0 13.1 Ritch, R., Shields MB, Krupin T, The Glaucomas, St. Louis, MO: Mosby; 1989:1067. ↑ Chandler PA, and Grant, WM: Lectures on glaucoma, Philadelphia, 1965, Lea and Febiger. ↑ 15.0 15.1 Morrison, JC and Pollack IP, Glaucoma : Science and Practice, New York, NY: Thieme; 2003: 226-236. ↑ 16.0 16.1 Schacknow P, Samples J. ,The Glaucoma Book: A Practical, Evidence-Based Approach to Patient Care. New York, NY: Springer; 2010: 517-525. ↑ Flanagan, DW, and Blach, RK, Place of panretinal photocoagulation and trabeculectomy in the management of neovascular glaucoma, Br J Ophthalmol 67:526, 1983. ↑ Krupin, T, et al., Long-term results of valve implants in filtering surgery for eyes with neovascular glaucoma, Am J Oophthalmol 95:775, 1983. ↑ Molteno, ACB, and Haddad, PJ, The visual outcome in cases of neovascular glaucoma, Aust NZ J Ophthalmol 13:329, 1985. ↑ Hampton C, Shilds MB, Miler KN, Blasini M., Evaluation of a protocol for transcleral Neodymium: YAG cyclophotocoagulation in one hundred patients. Ophthalmology 1990;97:910. ↑ Callens C, D’Hondt K, Zeyen T., The long-term effect of diode laser cyclodestruction on intraocular pressure. Bull Soc Belge Ophthalmol. 2003; 289:81-86. ↑ Hamard P, Gayraud JM, Kopel J, et al., Treatment of refractory glaucomas by transcleral cyclophotocoagulation using semiconductor laser. Analysis of 50 patients followed-up over 19 months. J Fr Ophthalmol. 1997;20:125-133. This page was last modified on March 9, 2018, at 17:09. This page has been accessed 156,051 times.